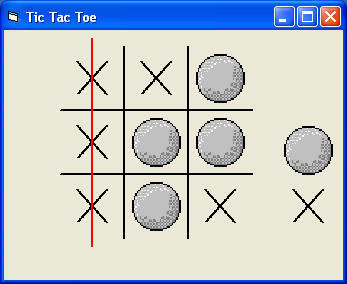 Tic Tac Toe is a popular game which you can play at any time and anywhere as long as you have a piece of paper and a pen, or you could draw it on sand or any surface. Now, we have programmed it in VB so that you can play the game virtually. First of all, you need to draw the interface with four straight lines, then insert nine image controls and make them an array, Image1(0) to Image1(8). Secondly, insert two pictures, one is a circle and the other one is a cross to represent player 1 and player2. To check whether a position is empty or not, we use two arrays, cross(8) and ball(8) (We use ball instead of circle because circle is an internal function of VB) and set them as Boolean. If cross(n)=false and ball(n)=false, that means position n is not occupied by a cross or a ball, where n is any integer between 0 and 8. In addition, you need to insert eight straight lines that would cross out three crosses or three circles if they are aligned in a straight line side by side, as shown in the diagram. You need to make these lines invisible at start-up and make one of the lines appear whenever the above condition is fulfilled.